For the timers listed below, Omega has only ever offered the #461-058 Dual Pedal Footswitch. Many users find the Dual Pedal Footswitch rather expensive, don't feel they need the "Focus" pedal, and would prefer a less expensive single pedal footswitch. 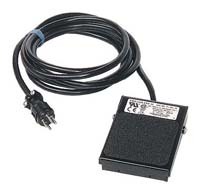 For those customers, KHB Photografix now offers a custom Single Pedal Footswitch with the correct connector for use with those same timers. Supplied with 8-foot cord.